No other book in the history of publishing has assembled in one volume 80 years of pansexual scandals associated with the Kennedys-all in one guilty pleasure of a sizzling book. Meticulously researched, it showcases the indiscretions and extramarital romps of America's most famous political clan. In addition to lesser known and often shocking scandals about Jack (Mr. President), other parts of this pioneering page-turner will be devoted to Bobby andTeddy, with extra space reserved for founding father Joseph P. Kennedy when he operated as a libidinous Hollywood mogul. Paparazzi cameras zoom in on that uber-goddess of all things glam, Jackie, documenting her many love affairs, which were matched only by America's Prince Charming, her son, John-John, a horny young man with a gleam in his eyes. 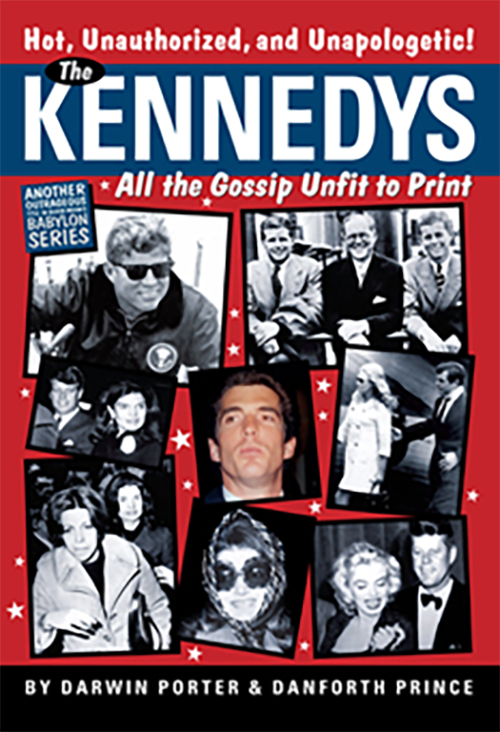 The Kennedys is illustrated with hundreds of candid photographs. "The great enemy of truth is very often not the lie—deliberate, contrived, and dishonest, but the myth—persistent, persuasive, and unrealistic." "The Kennedys were the first true movie stars to occupy the White House. They were also Washington's horniest political tribe, and although America loved their humor, their style, and their panache, we took delight in this tabloid-style documentation of their hundreds of staggering indiscretions. Keepers of the dying embers of Camelot won't like it, but Kennedy historians and aficionados will interpret it as required reading." Temporarily sold out of inventory: Available for e-readers only.